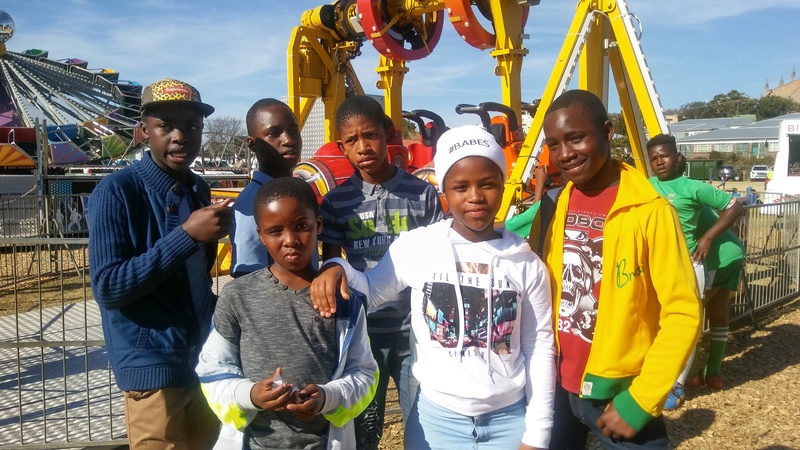 On the 6th of July, an excited bunch of awarenet learners trekked down the hill to see “Themba’s dream”, one of the multitude of shows Grahamstownians are treated to during the Arts’ festival. The learners in question were the winners of the awarenet Sports Day competitions in soccer and netball, so after all that running on the field they had certainly earned their right to sit down and enjoy a show. “Themba’s dream” is a musical performed by the Masifunde Youth Choir, an offshoot of awarenet’s fellow non profit organisation Masifunde Learner Development based in Walmer township in Port Elizabeth. In the musical, Themba is a young man from Walmer township who dreams of becoming a pilot and therefore sneaks out to the nearby Port Elizabeth airport whenever he has the chance to gaze at the marvellous machines landing and taking off. The musical was sung and acted energetically and professionally by a youthful cast who also had taken part in forming the script based on their own personal experiences. The story of Themba grapples with topics as diverse as social exclusion, unemployment, family violence, youthful love and gossiping neighbours. The closeness of the setting and topics to the actors’ real life made the play seem fresh and genuine. After the show the awarenet team collected feedback from the learners about the show and the festival in general for a Grocotts article we published on the 21st of July. Onke Mkhaliphi from Ntaba Maria Primary for example said that the show taught her that one should follow one’s dream even if other people taunt you and despise you for it. But the learners seemed to be a little disappointed that not so many visitors filled the streets of Grahamstown this year – and that there was no real “street vibe”. What all of them enjoyed though was the funfair on Fiddlers Green. That’s why we went there. Some of the learners enjoyed some fun activities before we brought them back to Joza and Fingo. Later that day, the awarenet team joined the Fingo discussion. This entry was posted in Arts Festival, Grahamstown Adventists PS, health and fitness project, Masifunde, Ntaba Maria PS, staff, Uncategorized, volunteers, Youth Day. Bookmark the permalink.